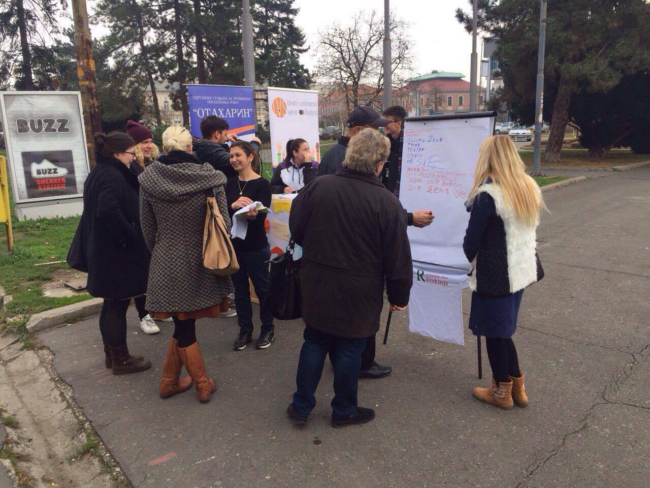 On 25 November, ERGO’s Network’s member from Bosnia-Herzegovina OTHARIN started its so-called ’16-days-activism’ campaign, which is run together with the ‘UG Romkinja’ (Roma women) and the ‘Local Voluntary Service’ in Bijeljina. The first part of the program took place on the 25 November 2016, the International Day for the Elimination of Violence against Women, on the city square in Bijeljina. The participants of the street action wrote messages about the topic of violence against women and asked citizens who passed by to do the same to show their support. T-Shirts were donated in order to thank those who left their supportive messages. Unfortunately violence against women is increasing again, which makes it even more important to raise public awareness on that topic.